Bob Wright’s big laugh echoes from his office behind the front desk at Sett Recreation in Union South, as he talks about all that his time at Sett Recreation has entailed. 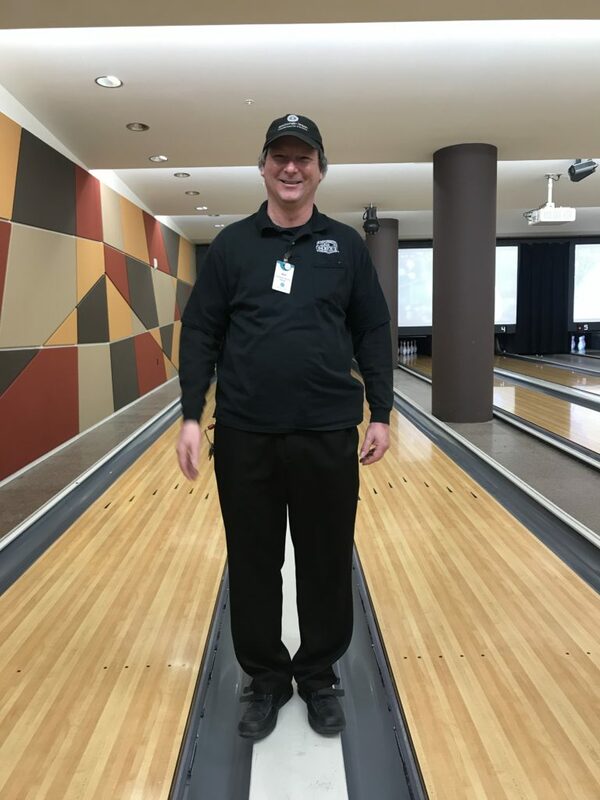 No two days are alike for Bob with Sett Recreation offering everything from an eight-lane bowling center to a two-story climbing wall. We invite you to take a glimpse into Bob’s days and into the center of recreation at Union South. What is your position at the Union? You’d think that’d be an easy answer, wouldn’t you? When I started as a full time employee, I was the recreation services manager. But over time, the position has changed, so now it’s pretty accurate just to call me the Sett Recreation manager. How much time do you have? I oversee the operations of Sett Recreation at Union South. More specifically, as the only full-time employee at Sett Recreation, I’m responsible for doing payroll, merchandise receiving reports, working with CESO to book reservations, scheduling staff, ordering parts and supplies, working with marketing, and a fair amount of maintenance. I could go on and on but that’s about 90 percent of what I do on a weekly basis. I’m also the advisor for the UW-Madison bowling team. How long have you been at the Union? Well, I first got involved with Hoofers my freshman year, which was 40 years ago. Originally, I was involved with the Scuba Club. Then I got involved with the Sailing Club and started working in the Union’s mooring field with the outdoor programs director, and, when he left, I took over as the mooring field diver. That was my first paid position. After I graduated, I went to the Peace Corps, and then I came back for grad school and was offered the opportunity to take over some of the responsibilities in the program office. That morphed into other positions over the years. Things have changed around in terms of what I was managing, but it’s been fine-tuned to managing Sett Recreation. What’s your favorite part of working at the Union? I hate sounding trite, but the first thing that comes to mind is the people. Working with the variety of people involved here is amazing. We get such a broad range of skills and people with different backgrounds, and the students are great. The reason I still enjoy working here after so many years is that there’s always something new, which keeps the job interesting and fun. What is one challenge you face in this position? Working with the students is the best part of working here, but it’s hard seeing them leave. You know when you get these really great employees that they’re going to graduate and leave. I will never get used to that, these great people leaving. After graduating from UW-Madison, Bob spent three years in the Peace Corps in Belize. When he isn’t working to keep Sett Recreation up and running, Bob enjoys woodworking. In fact, if you’ve been to Ginger Root, you have Bob to thank for the wooden frame that houses the gong outside its doors. Along with woodworking, you can find Bob at the park playing with his dogs. To learn more about Sett Recreation, visit union.wisc.edu/sett-recreation.